Fred tears through a tune on his Excelsior on August 25, 2007 at the Friar Tuck Resort in Catskill, NY. Rick and Tom make some new Jager friends on August 25th in Catskill, NY. Gabe, Fritz, Tom, and Rick are pictured here with their friends (L-R) Kim and Patti, as they have a little "toast" before FPB's second set on August 24th at the Washington County Fair in Greenwich, NY. 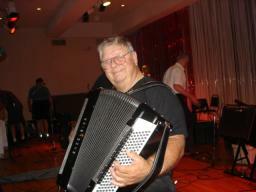 Fred is all smiles as he cranks out a tune on his Excelsior on August 24th in Greenwich, NY. 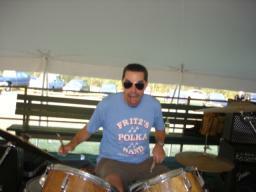 Rick (modeling his Nelson sunglasses) rips through a tune on August 24th in Greenwich, NY. 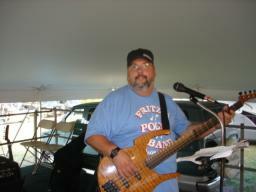 Gabe is pictured here during FPB's first set on August 24th in Greenwich, NY at the Washington County Fair. 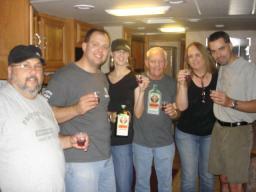 The guys in FPB with their friends (L-R) Fran, Charlie, and Kim) have a little "toast" before FPB's first set at the Washington County Fair on August 24, 2007. 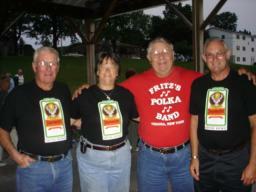 Fritz is pictured here at the conclusion of FPB's August 14th gig with his good friends (and FPB Fan Club Members), Jean and Bob Hansen. At the conclusion of FPB's gig at Pulaski Park in New York Mills, NY on August 14th, Fred is pictured here with some of his good friends. Fritz is shown here at the conclusion of FPB's gig on August 14th with FPB Fan Club Member, Isabelle Krish, as she tells Fritz she wishes that was a real bottle of Jagermeister! Fritz is in a button-box "rage" during FPB's gig on August 14, 2007 at Pulaski Park. Frank smiles while Fred maintains a more serious look during FPB's gig in New York Mills, NY on August 14th. As George's brother, Bob looks on, George and Gabe are shown here playing a tune on August 14th in New York Mills, NY. 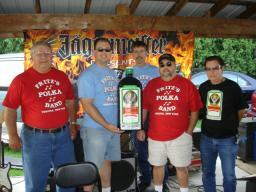 Fred, Fritz, Frank, Gabe, and George with their "bottle" of Jagermeister, prior to firing up on August 14th at Pulaski Park in New York Mills, NY. 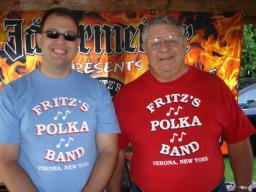 Fritz and Fred are shown here prior to the start of FPB's gig in New York Mills, NY on August 14, 2007.